I love baking Italian bread. This is always a fun thing to do with the kids if you don’t mind a little mess in the kitchen. There is nothing like making it yourself. If you can find the time you should try it at least once. If it’s not perfect the first time don’t get discouraged. I’ve failed time and time again on many occasions, but just kept on trying until I got it right. This is the basic recipe that I use all the time. Almost everybody does. It consists of only four ingredients. All the time is actually in the kneading and rising of the dough. Whether you make long narrow loaves or round ones you’re sure to enjoy this bread with stews, soups, pastas and a variety of other Italian favorites. You could put a sign in your kitchen that says “Baked Fresh Daily” after perfecting this recipe. Let yeast stand for at around 10 to 15 minutes until yeast is foamy. Meanwhile put 1 and 3/4 of cup of warm water and the salt in a large bowl. Blend in 3 cups of sifted flour. Add softened yeast to flour water mixture and mix well. Add about 1 half of the remaining flour and beat with a wooden spoon until smooth. Mix in a little more flour to make a soft dough. Through the dough on a floured surface and let it sit for around 10 minutes. To knead the dough use the heels of your hands and gently push the dough away from you. Fold the dough and repeat continuously for about 5 to 10 minutes until dough is smooth and elastic. Sprinkle a very little amount of flour on the dough if it becomes to sticky to handle. Shape the dough into a smooth ball and place in a large greased bowl. Just dab some olive or vegetable oil on a paper towel and grease the entire bowl all away to the top. Turn the dough one to coat with oil. Cover the bowl with plastic wrap and let stand in a warm place for around 2 hours until dough has doubled. After 2 hours punch down the dough and knead on a lightly floured surface for about 2 minutes. Cut into two equal balls and cover for another 10 minutes. Shape the balls into loaves and place on a greased baking sheet. Cover loaves loosely with a towel and set aside in a warm place until doubled. Bake bread for 10 minutes and reduce the heat to 350 degrees. Bake 20 to 30 minutes total or until golden brown. 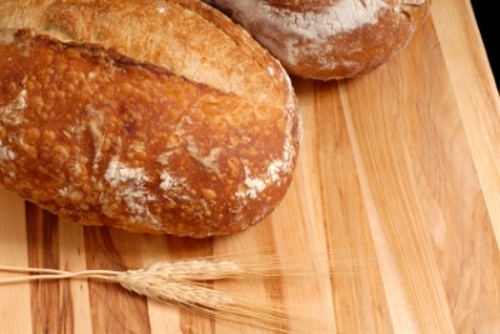 To get the bread nice and crusty, place a flat pan of boiling water at the bottom of the oven during the baking period.